This is a short piece I made as a music theory project in 2004, during my undergraduate at USC. I’ve never liked the title but it’s fairly apt and I haven’t found a better one. The music theory class in question, incidentally, was taught by the talented and inspiring Veronika Krausas. The piece consists of a single set of pitches (all realized as sine waves), presented in two ways and in three different layers. The foundation of the piece is a cantus firmus, a simple just-intonation melody in a low register. The cantus lasts for the entire duration of the piece. It does not repeat, but it is composed of two similar sections. The duration of each note in the cantus is inversely proportional to its pitch, such that high notes are shorter than low notes in a proportional way. The lowest pitch of the cantus (and of the entire piece) is a concert A at 55Hz, which is high enough to hear but low enough that small speakers won’t be able to produce it. You’ll want a woofer of some sort to get the full spectrum of this piece. A diagram of the cantus follows (click it to embiggen). The x-axis is time, labeled in minutes and seconds. 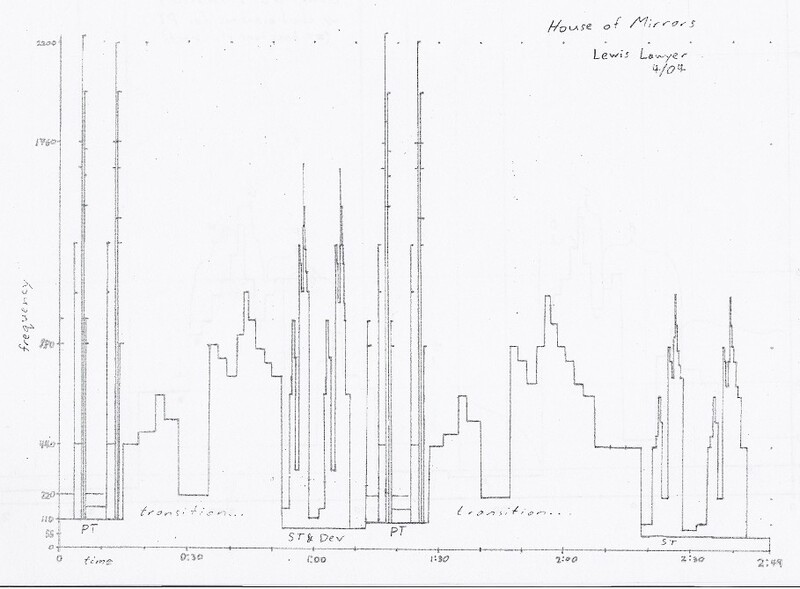 The y-axis is pitch frequency in Hz, which for some reason I represent linearly instead of logarithmically. Horizontal gridlines show the locations of concert A’s. The cantus is divided into groups of pitches labeled A–I on the above diagram. Each of these groups is presented as a simultaneous chord in the “Primary Theme” (PT). The PT occurs twice, once at the beginning of the piece and once at approximately 1:10. The “Secondary Theme” (ST) consists simply of the cantus melody, presented in higher registers and at faster durations than the original cantus. The ST also occurs twice, once at about 0:50 and once at the end of the piece. 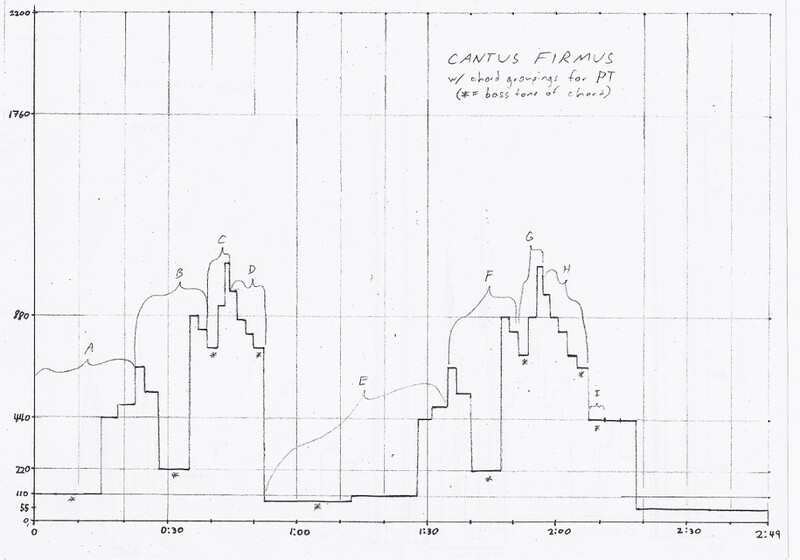 The following diagram indicates how the PT’s and ST’s are arranged in relation to the cantus firmus. This diagram can be thought of as a “score” for the piece, or perhaps better as a graphical analysis of it. Each instance of the PT and ST is arranged such that its lowest note has the same pitch as the cooccurring note in the cantus. All other pitches are modulated accordingly. Thus when the ST occurs over an E (as it does around time 0:50), this entire occurrence of the ST is a fifth above the ST at the end of the piece, which occurs over an A. Moreover, each entire instance of PT or ST lasts exactly as long as the cooccurring note in the cantus. All relative durations are preserved, but absolute durations are modified such that each theme fits exactly onto one note of the cantus. People who have taken a music theory course including the analysis of Western musical forms should be suspicious that I am talking in terms of primary and secondary themes. Perhaps they are shaking their heads in shame, or trying to forget bad memories. Yes, I did engineer this piece to be in a (simplified) sonata form. The secondary theme’s occurring first in the dominant and then finally in the tonic is typical of simple sonata form. Also there are two “transitions”—in this case, sections of higher pitches in the cantus. Of these, the first transition wanders afield from simple overtones of A; whereas the second has the same melody shape as the first, but all of its pitches are strictly overtones of A (55Hz). This is also intended to be reminiscent of sonata form. The only thing lacking from canonical sonata form is a development (although I have optimistically labeled the first occurrence of the secondary theme as “ST & Dev” in the diagram above). The version of House of Mirrors presented here is an exact recreation of the version I made in college, the only difference being in the process of production. The original sound file was produced laboriously by generating individual sine waves in CoolEdit and mix-pasting them on top of one another manually. A month ago I reopened the project and automated the production process. Now a perl script takes a set of numerals representing the cantus melody and generates a csound score file. The rest of the work is done by csound, bless its little binary heart. So far I have only used this process to reproduce the original piece, but potentially I can also make pieces of the same concept but with different melodies. Or I could make a longer version of the original piece which includes a proper development. Stay tuned! This entry was posted on Saturday, September 11th, 2010 at 1:35 pm	and is filed under electronic. You can follow any responses to this entry through the RSS 2.0 feed. You can skip to the end and leave a response. Pinging is currently not allowed.